At the 11th Global Communication Conclave held in Bengaluru in March 2017, Akshaya Patra won five PRCI (Public Relations Council of India) Collateral Awards and a Chanakya Award. For the organisation, this was the third time in a row winning PRCI awards under multiple categories. 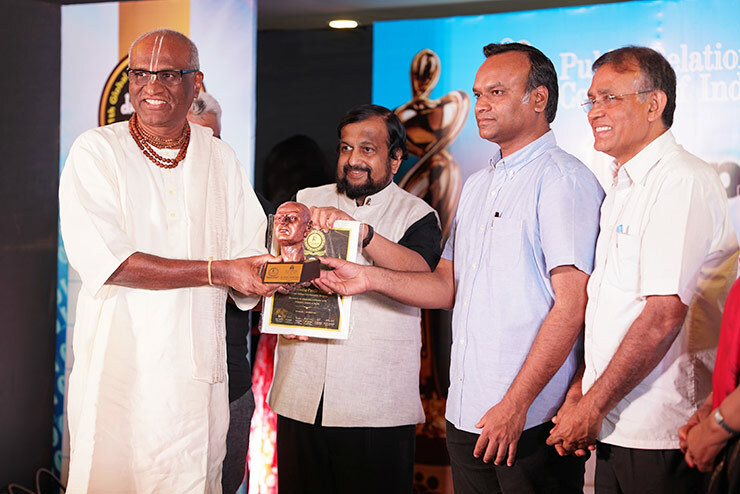 In the picture: Shri Madhu Pandit Dasa (left) receiving the Chanakya Award from Mr Priyank M Kharge, Minister of State for Information Technology & Tourism – Karnataka and Mr MB Jayaram, Chairman Emeritus & Chief Mentor of PRCI. Shri Madhu Pandit Dasa, Chairman of Akshaya Patra, was honoured with the prestigious Chanakya Award for being a ‘National Achiever’ 2017 under the Social Leadership category. PRCI is a National Body of professionals from Public Relations, Corporate Communications, Advertising, Media, Event Managers and Academicians. The PRCI Annual Award is one among the most esteemed event in the arena of corporate communications and is conducted to recognise and applaud excellence in talent and professional standards. We thank PRCI for recognising Akshaya Patra’s efforts in the development sector.